I’ve always wanted to write a piece on insecurity but something was stopping me: my own fears. I used to be a very insecure person in the past, because I was too insecure to ever imagine being happy with someone or to amount to anything in front of others. I had a lot of issues in the past that I drove through and they still haunt me sometimes. But now, I think it’s time I finally write on insecurities; this is going to be very personal. Insecurities work like cancer, they can slowly destroy you from the inside and in lieu of those insecurities, you destroy every meaningful relationship you have in your life.This article is going to be solely about insecurities in relationships, this is going to be about the fear, the sorrow, the feelings people feel when they’re insecure and how to deal with those insecurities. Let’s begin. Insecurities basically are negative thoughts. They can be personal, they can be about someone else, they can go anywhere if you let them. Steer clear of the negative thoughts and don’t let them give birth to a new insecurity in your life. Be a positive person, be someone people love being around and spending time with, project a positive aura around you. It takes one very small negative thought to give birth to a very big train of thought of negativity where you can easily get lost and never return. Be kind, be grateful, be generous and be positive! 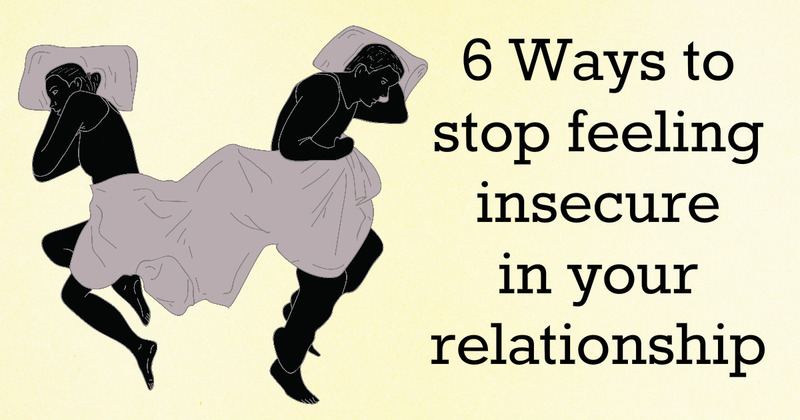 Don’t let society make you insecure about your relationship. People love to talk, people love to judge, people have more than enough free time in their hands to just sit and talk about others and not in a good way, that’s what people do and that’s something that shouldn’t affect you in the slightest. Don’t be someone who lets hearsay affect their relationship (I honestly still wonder how celebrities cope with this). In one ear and out the other is how you should be when it comes to “what others say” about the person you love. You love someone, not for everyone else, but for yourself; you know why you love them, you know why they make you smile, you know everything about them, “people” just know your names. Don’t let them bother you. I used to be this person (honestly, I think I still am, but I'm a work in progress): the person who used to make new issues out of nothing, I used to find problems that didn’t even exist. I was a very pessimistic and negative person. I used to be one of those people who think something bad is going to happen, even if life is as good as it can be. Stop doing that to yourself. If nothing’s wrong, it actually means nothing’s wrong! We start creating small problems out of thin air and they slowly develop into major arguments and fights and nobody knows what started them. Be naturally happy; it’s not going to be easy but just enjoy life, enjoy the time you spend with your partner and don’t let any sort of negativity come into your mind even for a second. People develop insecurities from past experiences. Talking about myself here, I was too afraid to trust anyone after my last relationship. I was too insecure about myself to let anyone love me or to let myself fall in love with someone. I just didn't believe that a 'happy ever after' was meant for me. It was because of how many times I was cheated on in the past. But it was unfair to anyone new in my life that I base everything on my past. I’m rejecting their care, their love, their trust, their affection based on something someone did to me years ago. I knew it was wrong, so I dealt with it. I learned to not be insecure about myself and I let myself free. If you stay in the past, you’ll never live your life; you’ll just ponder over what could have been and what should have been. Remove the “have beens” from your life and live today! Silence is beautiful, don’t be scared of it. “Silence is golden”. Sometimes, people take the silence of their partners as a trigger to something negative. Thoughts start coming in their heads; thoughts like “What are they thinking?”, “Is it something I said?”, “Are they trying to hide something?” or my personal favorite “Are they cheating on me?”. Your mind will go as deep into the negatives as you let it, don’t let it. Don’t try to read your partner’s mind and respect their privacy, no matter how close you are to your partner. Don’t let insecurities play a part in this, once you let your mind wander through the field of the negatives, you’ll never come back. Give them space. These sort of situations arise when there is a gap in communication, as I’ve said a thousand times before that communication should be very strong in every relationship. Say what your heart wants you to say and don’t let insecurities come in between. Welcome to the real world, where nobody is perfect and the consequences of the choices you make are very real. Don’t let yourself be brainwashed by what you see in the movies, there is no such thing as a “perfect relationship” in this world no matter how much two people love each other. Don’t blame yourself or the person you’re with if the relationship you’re in is the relationship you’ve fantasized about and then be insecure about it and let your mind play tricks on you. We are all human, we are bound to make mistakes and our imperfections are what make us beautiful.